Rocky Mount native, famous swing music bandleader and Inaugural Twin County Hall of Fame Class Inductee, James Kern “Kay” Kyser (1905-1985), was recognized again recently in two special ways. On October 5th, the North Carolina Department of Natural and Cultural Resources, unveiled a new marker on Sunset Avenue, next to First United Methodist Church in Downtown Rocky Mount. The ceremony was followed by a performance of music from Kyser’s band by the Tar River Orchestra’s Swing Band at Rocky Mount’s First Friday event at the Imperial Centre. 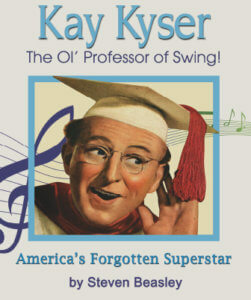 Kyser is the best-known bandleader in America. Neither a singer nor a musician, Kyser became a bandleader almost accidentally when he was asked to lead a local band made up of UNC students, said Fay Mitchell, a public relations specialist with the the Department of Natural and Cultural Resources. The group achieved its first No. 1 hit in 1935 and altogether had 10 more, garnering 35 hits in the Top 10. Many of the tunes were whimsical, with the last hit being the theme music of the “Woody Woodpecker” cartoon series. 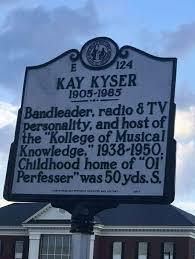 Kyser’s band gained a radio show in 1938, the “Kollege of Musical Knowledge,” where Kyser used the persona of the “Ol’ Perfesser,” who engaged various band members, including Ish Kabibble, in his antics. By the mid-1940s Kyser had become one of the most popular and best-paid of the big band leaders. Featured on radio from 1938 to 1948, the show moved to television from 1949 to 1950. In 1942, a fire destroyed much of the band’s musical arrangements and it subsequently adopted a jazzier approach to its music. During World War II, Kyser frequently entertained U.S. servicemen as part of the USO program. During this time he met his future wife, Georgia Carroll, after she became a vocalist with the group. The 1940s incarnation of the band also launched the career of singer Mike Douglas, who later became a popular television talk show host, Mitchell said. “Disenchantment with the trappings of show business fueled by health problems contributed to a genuine feeling in Kyser that his efforts paled beside those of people in service to others,” Mitchell said. 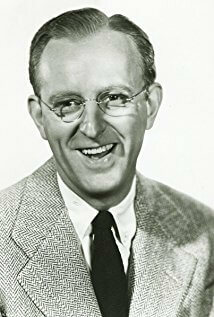 Contracts kept Kyser in his career for several years, but when the television contract for “Kollege” was cancelled in 1950, he quietly quit. Retiring with his family to Chapel Hill, Kyser and his wife devoted their efforts to charity work. They supported UNC, especially the drama department, and played a role in bringing public television to the state. He supported the Good Health Program and programs to foster health and to promote and finance hospitals and medical education, Mitchell said. In addition, an award-winning biography chronicling Kyser’s life and career, originally-published in 2009, has been reprinted and now available for purchase. Steven Beasley tells the story of a forgotten superstar and Rocky Mount native in the book “Kay Kyser — The Ol’ Professor of Swing” (Richland Creek; $23.95), a work 20 years in the making. Beasley explores many facets of Kay Kyser’s rise in popularity in a time that began when there were just three national radio broadcasting systems and no such thing as cable, and big bands performed in big ballrooms. Beasley begins the story with James “Kay” Kyser’s early life in Rocky Mount. His parents, Paul and Emily, both pharmacists, ran the town pharmacy. An interesting fact is that Emily had the distinction of being the first licensed woman pharmacist in North Carolina. Music was a part of the Kyser household; apparently everyone in the family had a pleasant singing voice — everybody but Kay. Though he had an intuitive feel for music and rhythm, he was never trained and was always frank about not playing an instrument or reading music, even when he became one of the most successful bandleaders of his era. In high school Kay was active in many extracurricular activities, including sports — he was a member of the basketball team, but he was too slight for the football team. Enterprising as usual, he formed a football team of a group of classmates who, like him, lacked the bulk of varsity squad members; the team was named the Tigers. There is a legend that the Tiger games grew larger gates than the regular team. One story, gleaned by Beasley from a newspaper report, tells that Kay organized a student body walkout on Armistice Day since he thought it should be a school holiday. According to the press report, the walk out was a success. Kay was class president in both his junior and senior years. His social conscience and his genius for persuasion led him, in his senior year, to create a plan that would insure that every member of the senior class would graduate. He had students who were doing well tutor those who weren’t, with the startling result that everyone graduated together for the first time in Rocky Mount High School history. He also became a cheerleader, an activity he would continue to enjoy once he entered UNC. During a time when school spirit was at low ebb at Chapel Hill, tryouts were held for varsity cheerleader. Kay took over, wowed the student body in the stands, and in his enthusiasm decided that there had to be an organized cheering squad. He recruited an enthusiastic group and led them as they rehearsed on the field just like the athletic teams. They became the Cheerios, a precision squad of 250 uniformed members. Among a myriad of other campus activities at Chapel Hill, Kay produced and staged the Playmakers shows. One of the other undergrads with whom Kay worked on theatrical productions was Hal Kemp, who had a campus band, the Carolina Club Orchestra. The band was popular locally and in surrounding areas, where they would play for dances and parties. By the time Kemp was ready to graduate, he had recorded some music for Columbia records and was getting time on the air. Kemp surprised Kay by suggesting that he put together a new band and lead it himself. The original six players that made up the band played by ear, weren’t very good, but Kay’s humorous shenanigans made up for shortcomings in the music, and as their music improved the band became regionally popular; soon they were booked for school dances on campuses all over the South. Beasley does a thorough job of describing the many steps that took Kay to the pinnacle of big band success and two stars on the Hollywood Walk of Fame, with his wildly popular radio and TV shows, “Kay Kyser’s Kollege of Musical Knowledge,” seven feature films and ballroom appearances that led to sold-out performances. Kay was even featured with Batman and Robin in an issue of the comic book Detective Comics. Beasley points out that even before Bob Hope, Kay was entertaining the troops, was featured performer with his band at innumerable star-studded charity benefits, appeared on magazine covers and used his clout to further many good causes. Still hugely popular, Kay realized that with the advent of jazz-bebop, which did not use large orchestras, big bands would soon be relegated to the shrinking number of venues that could afford them; and television had more people staying home to get their entertainment by way of the small screen. This state of the industry coincided with Kay’s desire to retire, so in late 1948, despite his still high ratings, he disbanded the group and ceased the tiring band tours. With a few delays in his retirement plans, Kay, his wife, the singer Georgia Carroll, and their daughters moved back to North Carolina and settled in Chapel Hill. Despite numerous attempts to lure him back into show business, Kay stood firm in his resolve to leave the limelight. Now Kay was in a position to focus his attention on other projects. One was the possibility of starting an educational television station in North Carolina. Kay, along with William Carmichael, UNC finance vice president and William Friday, UNC-Chapel Hill president, worked diligently on the process to acquire channels for non-commercial use from the Federal Communications Commission. There was no PBS in the beginning, so Kay had to use his connections on NBC for advice on equipment, and through his friends who were script writers and comedy writers in television he brought people to Chapel Hill to write programs that would make education more interesting for the average person. For four years, seven days a week, until WUNC-TV was running smoothly, Kay worked exclusively on the television project, and all as a volunteer. Now back home, Kay divided his time between his Christian Science interests and being a good father to his three girls. He lectured around the country for the church, and in 1983, Kay was elected president of the Worldwide Church of Christian Science. He continued his traveling lectures to the very end, even managing to give a lecture after a stroke. He died in July 1985. Puzzled as to why a huge star and media figure during the 30s and 40s with such a multi-faceted career could be forgotten by the general public, Beasely asked Georgia Carroll how she felt about it. She replied that some of it was his own doing, that if he had stayed in touch with the public a bit more, he would be better remembered in their minds today. She also commented that though his records were extremely popular, they were “of the time,” not the kind of music that would span the generations. The book is illustrated with scores of pictures: Street scenes, Kay with his peers in show business, scenes from movie productions, promotional posters, sheet music and magazine covers and formal portraits of band members. There is a complete list of recordings, and cast and plot of each of movie. Steven Beasley is an international writer, musician and producer currently living in the Los Angeles area. Kyser was a member of the first class of the Twin County Hall of Fame in 2006. Click here to view his induction page.